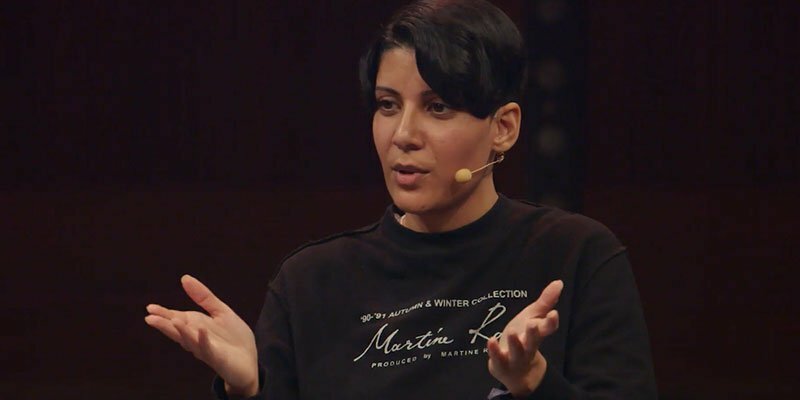 Born in Senegal, raised in Kuwait, and based in New York, Fatima Al Qadiri is among the most creative and conceptually savvy electronic music producers to surface in recent years.In her audio and visual work, Al Qadiri draws on both personal narrative and a critical engagement with current social, political and aesthetic developments. Her musical output has ranged from "Desert Strike", an EP inspired by a video game she and her sister played in Kuwait, shortly after the Gulf War, to Asiatisch, an uncanny retro-futuristic travelogue through an imagined China that she produced almost entirely with software emulations of traditional Chinese instruments. Her most recent album, Brute, is a meditation on the anti-police brutality protests that have been taking place in the U.S. in recent years. At Loop 2016, Fatima Al Qadiri spoke with Jace Clayton, musician and author of “Uproot: Travels in 21st-Century Music and Digital Culture”. In a fascinating exchange, the two artists discuss leaving one’s artistic comfort zone and challenging accepted notions of what electronic music can be about in order to make music that deals with protest, globalization, and the limits of democracy. Follow Fatima Al Qadiri on her website and Bandcamp.